I love to read all kinds of books, including “self help” types. 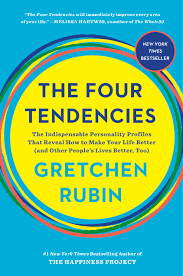 One of my recent reads is called “The Four Tendencies” by Gretchen Rubin. I’m a fan of Gretchen’s work. I also listen to her podcast “Happier” and have several of her other books. 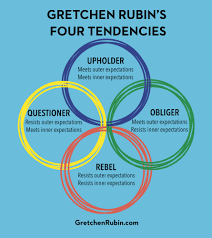 The reason I decided to talk about “The Four Tendencies” on my blog though, is that it explains a lot. I am terrible at keeping up with this blog, even though I really want to. It is on my to do list constantly and I’m always coming up with ideas for posts. Never the less, they don’t get done. Now if my husband were in charge of this blog it would be excellent. There would be a post done every week. If he sets a deadline for himself he meets it. 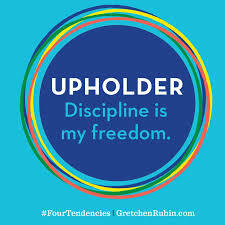 That’s because my husband is an upholder. He is super disciplined and always meets his goals. I am the exact opposite. I guess it’s true what they say…opposites attract. 🙂 Here is a chart of all four tendencies. Take this quiz to find out what your tendency is. Click here for the FREE quiz! Now tell me in the comments please. I can’t wait to hear. Most people are obligers, like my Mom. 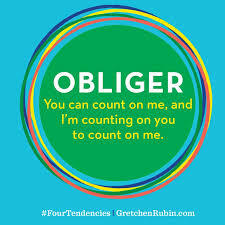 However, there isn’t a single obliger in my family of four. It would make life a lot easier if there was at least one, but both my kids are questioners. But that’s about family dynamics and not why I stink at regular blogging. 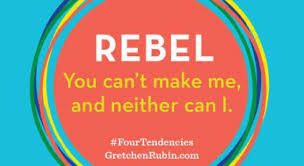 As you might have determined ( plus it was the title of this post)…I’m a rebel! I don’t want to do what you want me to, but I can’t really make myself do it either. What a mess! So this is my excuse. Thanks for sticking with my irregular posts and supporting me even in my undisciplined ways. I really appreciate all my readers and I want to do better for you. I promise that I will try. I also post on instagram ( @happyhoyt) a little more often. I think because it is easier and takes less time than an entire blog post. Follow me there as well. 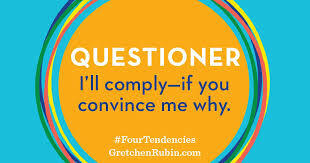 And don’t forget to comment what your tendency is. I want to know if there are any other rebels out there like me. Take care and happy travels.